By exploring and developing ideas, then scaling them up to benefit the whole Jisc community, the R&D service we offer aims to keep our members competitive long into the future. All our projects are managed through our R&D pipeline. It is designed to filter the most promising ideas and grow them to full Jisc service, and to decommission those services that are no longer relevant. Each phase of the pipeline fulfils a specific purpose. As part of our co-design process we take an in-depth look at some of the major trends in digital technology. Our horizons group members help us to identify the implications for institutions and inform Jisc strategy as well as prompting new ideas for R&D projects. Read more about our horizons group. We explore new ideas and emerging technology to establish which ideas meet Jisc member's needs, are technically feasible, fit Jisc's remit and stand a chance of becoming sustainable services. If an idea passes all these criteria, we move to the alpha phase. We try out the most promising ideas with a small number of organisations to see what works and whether they offer real world benefits. If they do, we move them to the beta phase. We develop the alpha prototypes into beta services and test the very best of them with a wider group of people. If a beta service addresses real member needs, and if it can be scaled up and delivered sustainably, we begin the process of turning it into a production service that can be rolled out across the target regions and receive our continued support. We treat each product or service independently so that we can be flexible and aim to react quickly to immediate opportunities so that our members really can take advantage of the latest thinking. We’re committed to ensuring that any potential ideas respond to a clear member need. As part of this our work undergoes a continuing cycle of evaluation and improvement, which continues for as long as the service or product is live, and may sometimes involve retiring services to ensure we remain relevant and solutions are cost-effective. Students submit ideas to improve education, research and student life. Those selected, including Call for Participants, were funded and students work on them for three months over the summer. The most promising ideas are supported further to test them with a small number of universities, colleges and learning providers. With our support, Call for Participants developed a prototype service for researchers. Successful prototypes are scaled up to test more widely. With our continued backing, Call for Participants spent 2014 delivering a service to researchers from 105 UK universities and we are now working to see how it can be delivered in a sustainable way to the whole Jisc community. Find out more about how we're developing the Call for Participants platform. Read more about the Summer of Student Innovation project. As part of our investigations into filling a gap in federated authentication for researchers, Moonshot emerged as a single, unifying technology that enables you to effectively manage access to a wide range of web and non-web services and applications. During this stage, we tested it with a range small number of research and academic institutions. Between 2013-14 we ran numerous beta projects in the UK and abroad. Having proved successful, our Assent service (evolved from Moonshot) was made available will be available to our community in March 2015. We have two key processes that help us move through the R&D pipeline. 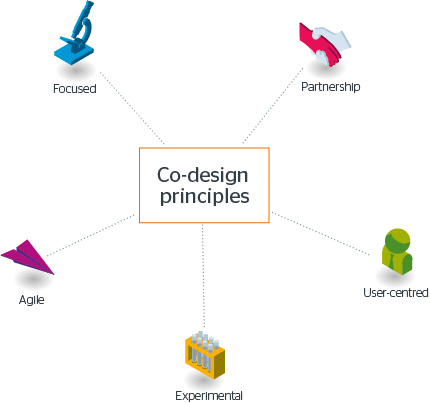 Co-design allows us to decide which ideas to pursue by working with Jisc members and stakeholders. Product management helps us to decide which ideas should graduate to becoming full Jisc services. Our members are at the heart of our R&D process, whether it's explaining the challenges they are currently facing, reflecting on our pilot projects, or sharing feedback on new services, ultimately we want to deliver new solutions that will work for them. The student view is also crucial and our regular edtech challenges (previously Summer of Student Innovation) offers us fresh insights into what students are looking for. We also collaborate with people outside the Jisc community, including commercial providers, where we believe that those partnerships will deliver benefits. We work closely with our members in higher education, further education and skills and in research to decide on the ideas we pursue so that all our R&D meets their needs from the initial idea to the end solution. By embarking on carefully targeted activities designed to realise our 2020 visions we can ensure we give those projects the very best chance of delivering sustainable benefits to our community. We react quickly and get things moving, taking bold decisions to ensure that our portfolio remains aligned to members' priorities. We seek a balance of risk in our activities to make sure we are regularly delivering services that add value to our community while taking controlled risks to explore new and uncertain areas that have the potential to offer still greater benefits. Our R&D work was steered by a set of codesign visions for 2020 and 2030 but these visions have now been superseded by the horizons group. If you want to know more about our R&D contact us at innovation@jisc.ac.uk.